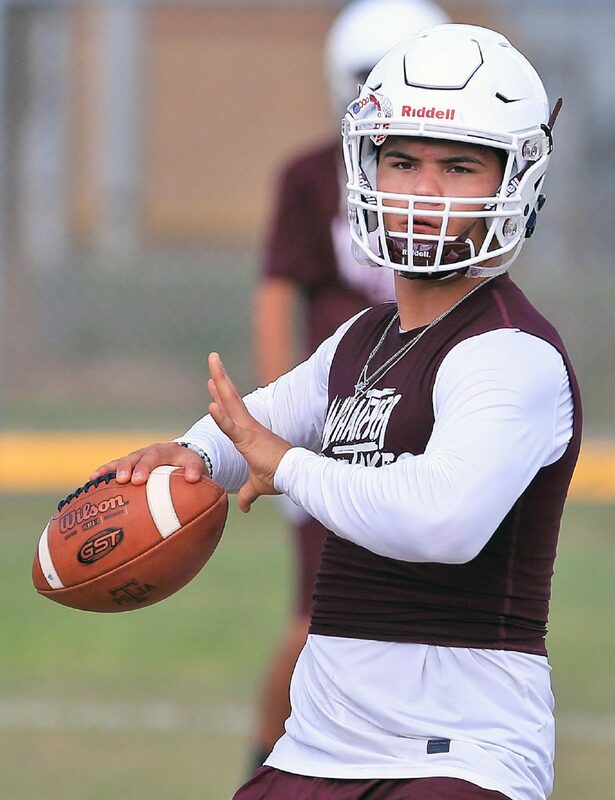 Trey Guajardo passes the ball during football practice at PSJA High School on Tuesday, Aug. 14, 2018, in San Juan. SAN JUAN — During coach Lupe Rodriguez’s first season at PSJA High last year, the Bears took District 31-6A and much of the Valley by storm. Gunslinging quarterback Trey Guajardo threw for 2,919 yards and 29 touchdown passes as a junior en route to a second-place finish in district and a return to the postseason after a two-year absence. Six different receivers caught a Guajardo pass for a score, and two of those players return, led by Trey’s younger brother Marco, who had 27 receptions. The receiving core that Trey will throw to this year has varsity experience and is now part of the main attraction. The quarterback saw his team go from 3-7 to 8-3 in just one year. He knows that giving opponents a rare pass-first look goes a long way, and he said he hopes that strength can carry the Bears deep into the postseason during his senior year.